» How Many Times Have You Studied that Phrase? How Many Times Have You Studied that Phrase? The phrase "Times Studied: and then a number shows how many times you have studied this phrase." 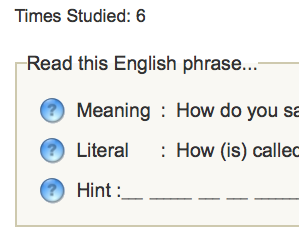 We just now made knowing the answer a LOT easier by adding a feature that shows you the word, “Times Studied: ____” This appears at the top of the main study screen. You can also find the same information when you have clicked on the “I’m done for now, show me my progress.” button. Click or hover over the blue ? (on the progress page not here) to find out how many times you have studied a phrase. We originally developed this as a debugging tool that was never intended to be a feature. Then we accidentally rolled it out and people started telling us that they really liked it. The real problem was that since this was intended to be a debugging tool, not a real feature it didn’t really do what people thought it did. Well now it really does what people expect and the answers are accurate.